The amazing Cristiano Ronaldo headed in the first goal as Portugal topped Wales and its superstar Gareth Bale 2-0 in the semifinals of Euro16 on Wednesday. On Sunday, Portugal will host France in the Euro16 championship match … and on July 27, Ronaldo and Bale will be in Columbus, as their Real Madrid (Spain) squad takes on Paris Saint-Germain (France) in the International Champions Cup. How’s that for some international soccer star power right here in Columbus? 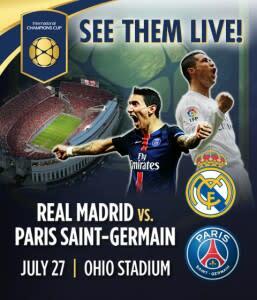 “Real Madrid is recognized as the most famous soccer club of all time and Ronaldo is the best player in the world,” said Ohio State men’s soccer coach John Bluem. Bluem and perhaps as many as 100,000 soccer fanatics will be at the match, which is part of the fourth edition of the International Champions Cup. The 10-team lineup includes many of the top clubs in international soccer: Liverpool, Chelsea and Leicester City from England; Paris Saint-Germain, AC Milan and FC Internazionale from Italy; Real Madrid and Barcelona from Spain; Bayern Munich from Germany; Celtic FC from Scotland. These teams feature about 50 of the world’s top 100 players. All the games of the 15-match tournament will be broadcast on the ESPN family of channels. Click here for more information and ticket information. The Shoe – which will get a temporary grass field for the game – is a fitting place for this world-class match. It was the first home of the Columbus Crew SC and 31,550 fans attended the Sept. 15, 1996 game against New York. This is still the team’s all-time attendance record. The U.S. record for attendance at a soccer game is 109,318, which was set on August 2, 2014 when Real Madrid and Ronaldo took on Manchester United in an International Champions Cup game at Michigan Stadium. Paris Saint-Germain may not have quite the star power of Real Madrid, but the team has won three consecutive French Ligue 1 titles and is the defending International Champions Cup champions. They are led by Thiago Silva, a member of Brazil’s national team.